The Redskins offense went through a major overhaul this off-season, adding not only a new quarterback in Robert Griffin III, but some extra players at the wide receiver position. Pierre Garcon and Josh Morgan joined Santana Moss in Washington, and Skins’ fans are hoping they can help create a magical rookie season for RGIII. Unfortunately, I’m not so high as some on this team offensively. Any running back on the Redskins. Last season, Tim Hightower was putting up startable fantasy numbers at running back before tearing his ACL. Then, after some back and forth in a running back carousel, Roy Helu seemed to solidify the job as starter. Now, at the beginning of July, it looks as though Hightower is back at being the man in Washington. Mike Shanahan, the coach of the Skins’, has been open about how he feels about the ex-Arizona running back because he feels Hightower seems to have more to his game than purely running up the middle of the field. Roy Helu is probably the most talented of the bunch in Washington, but given Shanahan’s inconsistency in choosing running backs from week to week, don’t expect Helu to be an every week guy. It’s unfortunate, because I think he has potential – he’s just not there yet. His numbers from last season tell the story, too. In games that the Redskins were ahead (when defenses were aware the Redskins would be trying to run the ball) Helu had a measly 2.8 yards per carry average. When the Skins’ were playing from behind, it shot up to 5.4. That’s not the kind of consistency you want out of a running back. The fact that Helu is going in round 5 in a 12-team standard league is somewhat of a joke. That’s just outside of being a startable back, and it’s just another reason that waiting until round 5 for a starting running back is a bad idea. Helu should be a backup on most fantasy squads, and Hightower possibly as well, but I’m most likely going to stay away from these Redskins’ running backs altogether. Robert Griffin III. Look, everyone is going to want the next Cam Newton, but the truth is, we shouldn’t assume RGIII will do what Cam did just a season ago. Newton put up numbers in 2011 that were unheard of for rookie quarterbacks. And he, last year, became the first fantasy football star rookie quarterback. I mean, if Cam Newton didn’t exist, do you think we’d be drafting Griffin III as a starter right now in 12-team fantasy football leagues? Remember, there’s a reason Newton was undraftable at the beginning of last season. 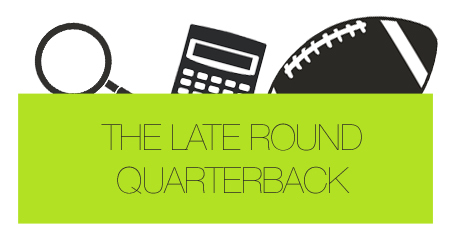 It’s because rookie quarterbacks don’t post startable fantasy football numbers. And while Robert Griffin III could end up being a fantastic quarterback, I think probability favors the upside of players like Jay Cutler or Matt Schaub – both of whom are being selected after RGIII. Pierre Garcon. I say this because, as I mentioned earlier, I’m not a big fan of any running back in Washington this year. He was a low end WR2 last year with Curtis Painter. And while you may think it seems ridiculous for me to conclude that his numbers are going to rise after what I just wrote about RGIII, I do expect his numbers to increase. Last season, the Colts ranked 21st in the NFL in offensive passing plays, and 26th in completion percentage. Pierre still finished as a startable wideout. The fact is, you can’t always equate wide receiver success to quarterback play. Larry Fitzgerald has been a fantasy stud the majority of his career, and there were only a couple of seasons where he had legitimate quarterback play. Last year, AJ Green finished as a top 15-20 receiver, and we all know that Andy Dalton didn’t put up unbelievable numbers. I may believe RGIII is overrated, and there’s no doubt that he’ll struggle at times in 2012. But if he targets a talented Garcon early and builds the kind of relationship Cam Newton and Andy Dalton did with Steve Smith and AJ Green, then we could see great numbers from Garcon. Humorous. People are going to try and understand this Mike Shanahan coached team, but good luck. It’s Mike Shanahan. If I’m you, I shy away from any of the running backs on this team, as well as the uncertain rookie quarterback, Robert Griffin III. The only player that I’d draft at his current draft value is Pierre Garcon. He’s young, talented, and has shown that he can compete with a struggling quarterback. It’s up to you, of course. I just like more upside out of my team.